Are you going through liquid laundry soap too fast? Use this easy laundry tip to save you liquid laundry detergent and time. An easy DIY tutorial idea. This isn’t my normal type of post but I have been doing this for close to a year and it has saved me so much on liquid laundry detergent, so it is only right that I share this tip with you! I can’t guarantee that this will work with all front loading washing machines. You may have to adjust to a different container for different machines. My front load washing machine has a drawer that pulls out that you can put detergent, bleach, and softener into. At the back of each compartment, the walls slope inward. This is what you really need to pay attention too. You want to make sure that that your container isn’t so small that it will fall through those slopes. A pill bottle is perfect because the container has a big edge for the cap so it won’t go past those slopes. 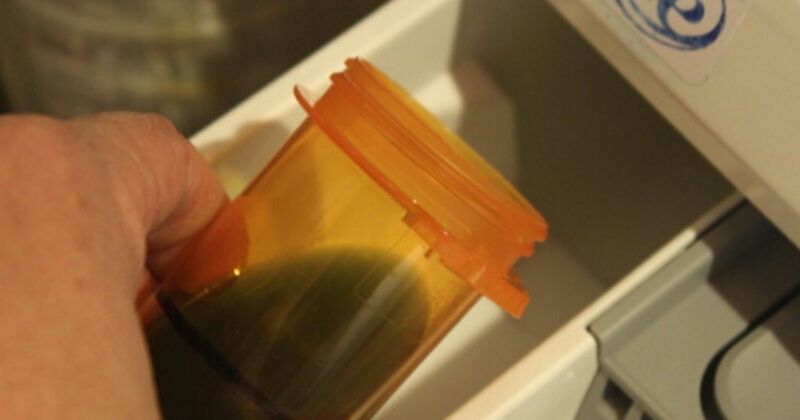 The pill bottle is also small enough that the drawer will shut with it in there as well. So I when I do a load of laundry I just shut the drawer and leave it in there. Measure out how much liquid detergent to use and pour it into the pill bottle, then draw a fill line with a permanent maker. I actually use a little bit less liquid detergent than is recommended. My clothes always come out clean and smell good, but I get a couple more loads out of a bottle. Poor into the detergent slot in the washing machine. Leave the bottle in the drawer and shut the door. This has really come in handy for my kids as well. They do their own laundry, and it is easy for them to fill it to the line and leave in the drawer. Plus it doesn’t get all gunky, and slimy because the washing machine rinses it with every load. To see more amazing tips, visit Why Didn’t I Think Of That? 24 Useful Tips. Will this tip help you save on expensive laundry detergent? Share and leave a comment below. SAVE HOW TO SAVE LAUNDRY DETERGENT TO YOUR FAVORITE PINTEREST BOARD! Wow, what a good idea. I am going to check out my machine and see if I can do this. I think I overuse detergent. Awesome tip and great way to recycle old medicine bottles. Thanks for linking to Tutorial Thursdays on Marigolds’ Loft. Hi, what I been doing now for a few years….I have what looks like that front loader,and it requires tide he. I buy the big orange bottle, and pour half into empty saved bottle. You can see it filling in the see through section of the bottles. Ii just keep going until both bottles look equal side by side… then take both bottles and slowly fill remainder of each with water. Put caps on and gently swish around. This gives me 2 bottles of detergent, and it lets my mind think I am using normal amounts. My clothes are just as clean, and I know I am saving bunch of money..works great! That is another great tip Rose. Thanks! Thank you Ana. I am so glad it is one that you think you could use. Thanks for stopping by. Also great for storing threads. Some are tall enough to store both the spool and the bobbin thread.Keeps things from getting tangled. A pill bottle won’t fit in my machine but I do watch how much I use. If most people would take the time to really look at the lines on the caps they would be surprised to see they are using far too much. I think a lot of people think they are supposed to use a full cap. I think the detergent and softener makers hope you will so they can sell more. I totally agree, Ann. You don’t need to use as much as the bottle says, and using the pill bottle serves as a reminder to me, and my kids who do their own laundry too. I’m sorry the pill bottle trick won’t fit to leave in your washing machine, but you could still use it just to measure so you are using a smaller portion and keeping liquid drips from falling down the bottle when replacing the cap. This looks like a great idea, but I think I’m missing the point. The cap comes with a measurement mark and I always use less than it says. So what is the point of putting it in the pill bottle rather than directly into the drawer? I don’t mean to sound snarky, I just want to make sure I understand the concept. I understand completely, Sidney. Your right, you can use the cap. I like to use the pill bottle because it’s easier for me to see the line that I drew, making sure I use how much I want to, and not how much “they” tell me I should use. Plus, each time I leave it in the soap drawer of my washing machine the little container always gets washed so I don’t have to worry about the lid getting all slimy and sticky. This is probably only a problem because I have kids who do their own laundry. When they put the lid back on they almost always drip liquid detergent all over the side of the bottle. I know what you’re talking about with the slimy cap. My sister and I share our front loader. Her caps always have dried detergent in the bottom of them. And if I fill my cap, empty it and put it back on the bottle it makes the bottle gross or it drips onto the surface of my dryer or the inside of the cabinet where I store MY detergent. I’ve taken to just filling the cap and foregoing the tray all together. I just throw the filled cap into the washer with my clothes. I’m trying to teach my nieces to do their own laundry and be responsible for their own clothes, since they don’t appreciate when I or their mother do their laundry (ie, clothes not put away or clean clothes all over their room). I like the pill bottle method, even if we just throw that into the washer. It’ll keep them from using too much. Thanks. You are welcome, Emmarie! I am so glad I could help with the slimy cap issue. Thanks for stopping by and leaving such a great comment! I used to just put the soapy measuring cup into the washer with my clothes. No more messy cup. Good use for pill bottles. Keep one at your sewing machine for broken needles and bent pins.